When traveling to Alaska, one never knows what might be in store as far as the weather is concerned. For the most part, we have had three months of the most amazing weather anyone could hope for. I guess it’s our turn for some nasty stuff. 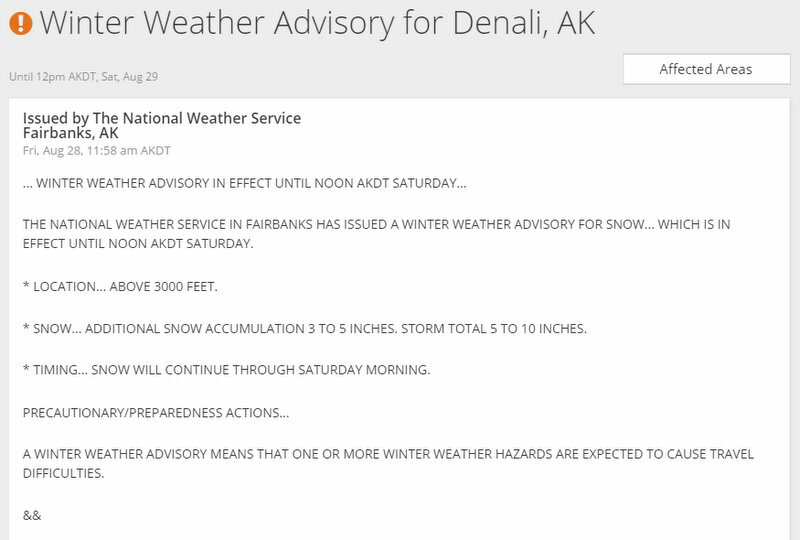 Ever since we arrived in Denali almost two weeks ago, it has rained virtually nonstop. Yes, there were a few nice days last week (when we were sick! ), but all I can remember is rain, and more rain. I hate to complain, but even the locals are sick of this weather. There has been so much rain that the park road has been closed on and off due to mud slides. Yesterday, the road was closed at mile 53 because of snow! Yes, snow in August! I’m just not believing it. The temperatures have really plummeted as well, and it will likely dip below freezing during the next few nights. Highs are only in the low 40s where we are. Brrr! 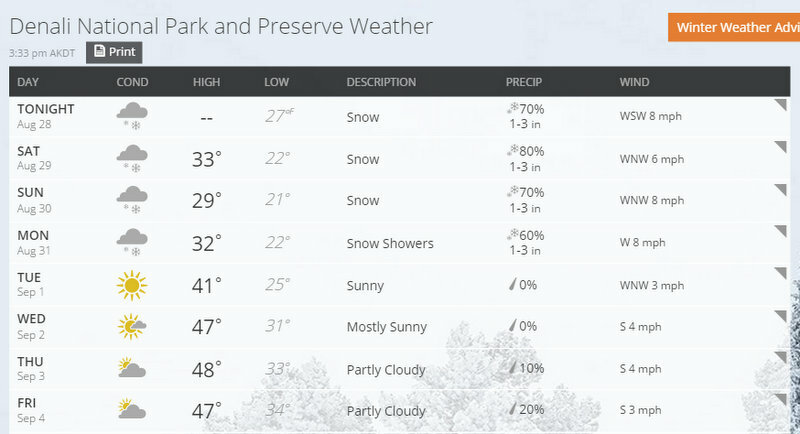 Now, to top everything off, the park is under a winter weather advisory until noon tomorrow! Seriously? 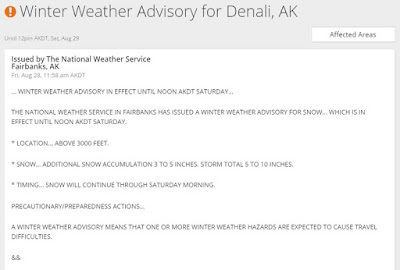 Although most full-time RVers would take this as a sign to get those wheels moving and head to someplace warmer, Tim and I are committed to working at Denali National Park through next Friday. Tim is conducting an on-site archival survey and accessioning project, and the work is going well. This project is not as glamorous as cataloging a historic photograph collection, but it’s an essential part of museum management. The contract with Denali has been a bit different than previous ones with other parks. Typically, Tim and I work together, with each of us undertaking different components of the same project. Here, Tim has been focused on his project, while I have been doing whatever needs to be done to help the park’s museum curator. I do get to work with Tim on occasion, but mostly I’ve been doing other tasks. The staff has been great to work with, and I’ve been learning lots of new things, which I always enjoy. Both Tim and I have had to spend a lot of time walking from building to building in the park headquarters area, where the roadways are under construction. I have to confess that my most enduring memory of working at Denali National Park will undoubtedly be this endless construction, constant rain and slippery mud. Employees at the park have had to deal with construction for the last three years, and I really do feel for them. They are ready for it to be over. One of the perks of volunteering at least 32 hours per week at Denali National Park is that our campground fees are covered by the park. That is especially nice when the rates top $40 per night for full hookups. Volunteers are also encouraged to get out into the park, and we are given a voucher for a trip on one of the park shuttle buses. Our friend Kathleen has gone out of her way to make our lives very easy while we are here. Not only did she let us stay with her last weekend, but she also picked up groceries for us while she was in Fairbanks last Monday. The tiny markets here only carry a few items, so that was a huge help. Kathleen also gives us a ride to and from work every day, which is especially nice since we are traveling without a car in Alaska. We can leave Kitty behind at the campground and not have to try and find a place to park the RV. I actually took the day off today (volunteers are only required to work 32 hours per week), since our propane gauge registered empty. Although I had thought about using my bus voucher to venture farther into the park today, my priority was driving to the nearby town of Healy to fill up with propane so we would have heat tonight. I also wanted to see if I could find a somewhat larger space heater than our tiny one. Have I mentioned that it’s been really cold? The trip was a success. Before I left, however, I decided to drive the RV to mile 15 in the park, which is as far as private vehicles are permitted. At least I would get to see a little bit of the park today. Much of the landscape was enshrouded in clouds, and visibility was limited, but the drive was still beautiful. It even snowed for a while, but the sun tried to peek through the clouds from time to time. Fresh snow blanketed the nearby mountains, and fall colors reminded me that winter is not far away in this part of the world. The snow added a new element to the park experience. Moose rutting season has already begun, and photographers were lined up along the side of the road to capture the action. I stopped and watched for a short while, and I was even able to see a bull moose in the distance – the first one for me this summer. Tim and I left Wasilla on a rainy Sunday afternoon. The forecast for the next week or more is for more rain and cloudy conditions, not what we want to hear as we make our way towards Denali National Park. Our plan for today was to go as far as Talkeetna, a quirky little town that reminded us of McCarthy. Talkeetna is a popular destination for vastly different groups of people. Every spring, the town is the starting point for mountaineers who are planning to climb Mt. McKinley, which is known as Denali in Alaska. The National Park Service has a ranger station in Talkeetna, and all climbers must start their journeys there. We stopped by the visitor center and watched the excellent film that follows the climbers as they make their preparations for, and then climb, “The High One.” It’s daunting just to contemplate what is involved and how determined someone must be to attempt a climb. Just over 1,000 climbers registered to climb the mountain this summer, and 57 percent made it to the summit. Flight services based in Talkeetna ferry climbers to the base camp at 7,200 feet. We had hoped to take a similar flight and land on the glacier there, but the weather was just not cooperating. 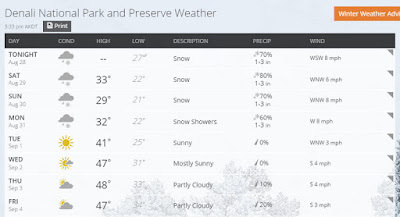 Although we had built several extra days into our schedule to allow for inclement weather, the forecast for the next week doesn’t look any better. Sadly, this is one adventure that Tim and I will have to forego this summer. I can’t be too disappointed, however, because we have been so unbelievably fortunate in virtually every other day trip we have taken since arriving in Alaska. For the most part, the weather has been very good, and when it hasn’t been, we still had amazing experiences. Although a flight to Denali was something that Tim and I were really looking forward to, we just can’t control the weather. Tim Finally Caught Some Fish! We had fun walking around Talkeetna and taking the obligatory cheesy, tourist photographs. I mentioned earlier that vastly different groups end up in Talkeetna. One group is busloads of cruise ship passengers on the land portion of their tours. I’ve read that the numbers of people can overwhelm this small town, but the throng of tourists was manageable by the time we arrived in the afternoon. After the Alaska Railroad pulled in and picked up the tour groups around 5:00 pm, the town was even more pleasant. We had an excellent dinner at The Roadhouse. Originally built in 1914 and established as an official roadhouse in 1944, it’s one of the most popular cafes and bakeries in town. We also wandered into the Nagley’s Store in hopes of seeing the town’s mayor, a cat named Stubbs. Stubbs has been the honorary mayor of Talkeetna since 1997, and he usually hangs out around the store. Unfortunately, he was nowhere to be found, and I was sad to leave Talkeetna without meeting him. 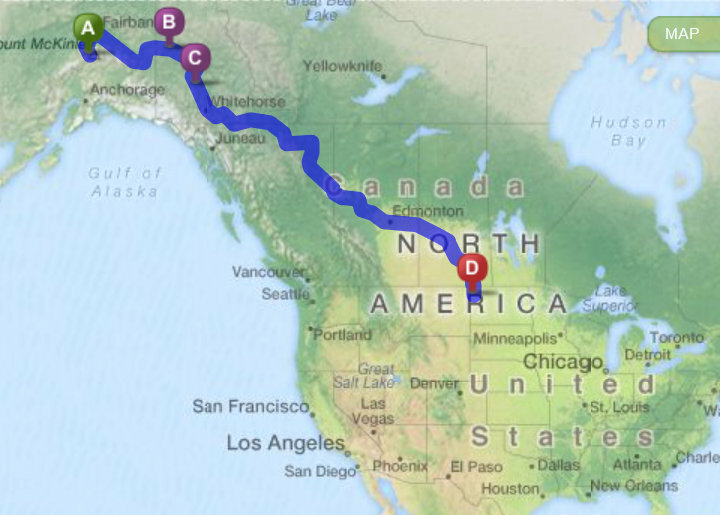 Tim and I had originally thought we would spend three nights on the road before arriving in Denali on Wednesday. We thought this would give us time to wait out the rainy weather and hope that the mountain would make its appearance. The long term forecast for continued rain, however, makes that prospect unlikely, thus prompting us to rethink our options. We have now decided to scratch our original plan. We’re spending tonight in a pullout just outside Talkeetna and will head directly to Denali tomorrow. After a lovely week on Portage Glacier Road, I returned to Anchorage so I could pick up Tim at the airport on Tuesday night. He had been in Oklahoma at Chickasaw National Recreation Area to prepare the park’s annual museum reports. This was a return visit for Tim, who flew to Chickasaw last summer to prepare the same reports. 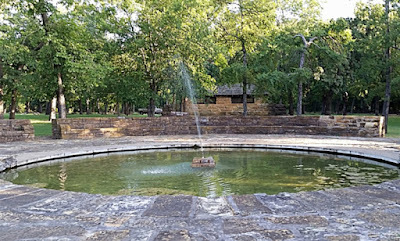 You might recall that Tim and I visited Chickasaw last December, and you can read about the park in this post. Chickasaw had recently experienced heavy rains in a short period of time, causing extensive flooding throughout the park. The silver lining to all this water was the replenishment of the water table. 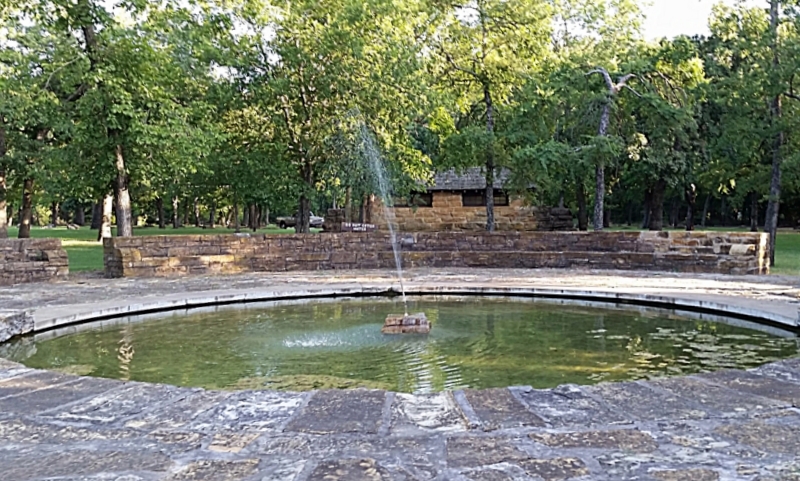 When we visited Chickasaw, many of the springs and fountains were dry. This time Tim was especially happy to see the Bromide Fountain flowing. This was a whirlwind trip for Tim, and a hot one. The temperatures inched into the triple digits while he was in Oklahoma, with a heat index of 116. He almost had a heat stroke and was happy to return to Alaska where temperatures have been in the mid-70s. We had decided that after Tim returned to Alaska, it would be time for us to start heading toward Denali National Park and Fairbanks. We expect Fairbanks to be our northernmost destination before we begin our trek south toward the Lower 48. In order to give Tim a break after his project, as well as catch up on laundry and other chores before leaving “civilization” behind, we decided to stop for two nights at a commercial campground. We had not stayed at a campground for nine days, a record for us. The solar panels are really doing their job and have opened up so many new opportunities. 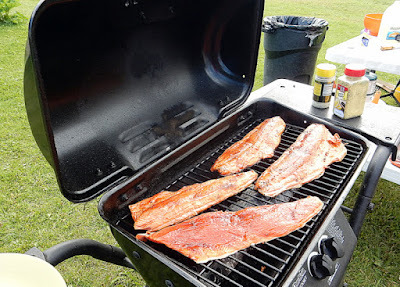 We picked Big Bear RV Park and Campground in Wasilla, where we had stayed a month ago. Big Bear is a nice, simple campground that we enjoyed the first time around, and this time was even better. We arrived to discover that the campground was hosting a salmon bake that evening – the first one of the summer. That was a stroke of pure luck for us, being at the right place at the right time. The offerings were plentiful and delicious. 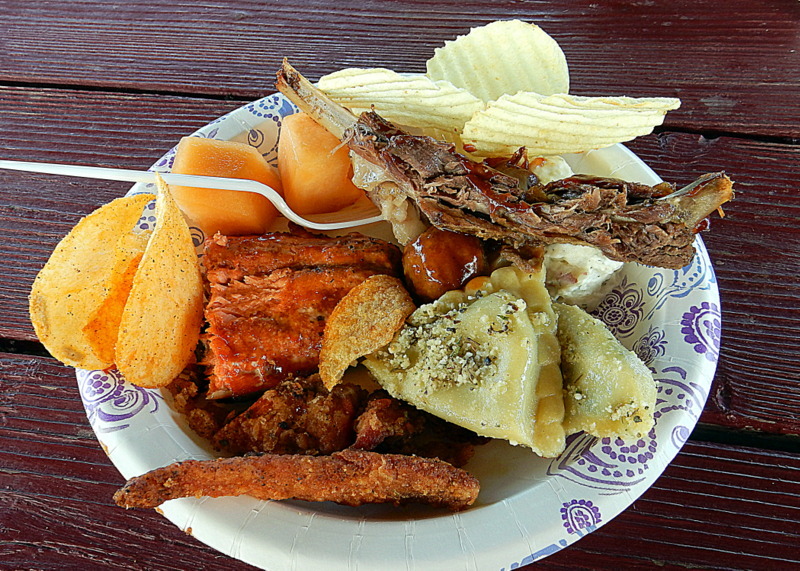 Grilled Copper River salmon, fried salmon fingers and salmon spread were joined by moose ribs and a moose casserole. Fellow campers provided a selection of side dishes, but the hosts took care of almost everything. What a treat! The salmon was delicious, and so was the moose, but my heart melted when I tasted the dessert – a rhubarb, blueberry, cranberry and raspberry crisp with vanilla ice cream. All of the berries had been handpicked. Yum! Everything else was also homemade by many of the relatives of the campground owners. What lovely people they are. The good food was matched only by the good conversation. While Tim was taking it easy on Thursday, he received a telephone call offering him another museum services contract. It seems that the folks at Fort Union Trading Post National Historic Site in North Dakota liked his work for them last year and want him back. That was an unexpected call. 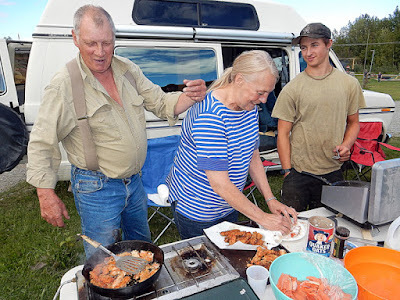 We decided to extend our stay at the campground so we could look at our schedule, and some maps, to see if we could work North Dakota into our plans. Tim and I both enjoyed working at Fort Union, so we hoped a return visit would be possible. Although we had originally planned to return to the Lower 48 via the Cassiar Highway, and then head towards Oregon, we decided that a trip down the Alaska Highway and on through Alberta and Saskatchewan Provinces would do just fine. We wouldn’t really have time to do much sightseeing along the way, but we had always planned to return to Canada for a much longer visit sometime in the next few years. So, we decided we could leave Fairbanks around September 1 and take three weeks before arriving at Fort Union by September 21. It would then require a quick dash to Colorado for our doctor and dentist appointments the week of October 11. With our new plans on the calendar, we were ready to leave for Denali. But, not so fast. Yesterday, Tim received another telephone call offering him the possibility of one more contract. What? What’s going on here? This one was really enticing – Denali National Park! But, how on earth could we possibly fit in another two-week contract before leaving Alaska and still make it to Fort Union in time? Extending our campground stay for another night gave us time to look at the schedule one more time. It looks like we just might be able to make it happen. Although the contract is not a sure thing – Tim has to meet with the museum curator at Denali this coming week – we think we’ve figured out a tentative plan. It would mean that Tim would have to work during much of our planned visit to Denali (I’m not sure how many days he’d want to spend on a bus anyway! ), and we would have only two weeks instead of three to drive to Fort Union (not our preferred speed at all! ), but this contract is something that Tim would love to do. I’m always up for an adventure anyway, so let’s make our last month up north one to remember. Wow! That's a Long Drive! I don’t think Tim ever anticipated that he would be offered so many contracts, especially since he hasn’t really been seeking them out. Most have come his way via word of mouth. However, he is thoroughly enjoying the work, and so am I, since I get to work with him on most projects. As the old RV saying goes, “RV plans are written in Jello, always some wiggle room.” I’m thrilled that this lifestyle has given us such flexibility to take advantage of opportunities that come our way. The return flights from Portland to Anchorage were uneventful, and Tim met me at the airport. We returned to Cabela’s for the evening since he was flying out the next day. It seems as if we just passed in the night. Soon it was time for him to board his plane for Oklahoma City. I had originally thought I would spend my week as a solo RVer touring a few places in the Kenai Peninsula. But, I changed my mind. I didn’t want to play tourist. I wanted to find a beautiful campsite, preferably on the water, and relax and regroup. Catching up on the blog, reading a good book and taking naps were high on my agenda. I drove down the Turnagain Arm, which is always a stunning drive, and turned left onto Portage Glacier Road. I was hoping that the boondock site that Tim and I had discovered several weeks earlier might be available. I pulled in and was delighted to find a perfect spot for the RV, right on the water and tucked away at the end of the pullout. I couldn’t have been more pleased. But, that’s not all. There was another RV parked at the opposite end of the pullout, and it belonged to the Gone with the Wynns, a couple whose blog I’ve followed for years. What are the odds that we would end up in the same boondock site at the same time? Jason and Nikki didn’t return until late, but I was able to meet them, and their cats, the next morning before they headed out to Anchorage. What an interesting couple! It seems as if bloggers are forever running into one another this summer. Soon after I arrived, another very nice couple set up camp nearby, and I enjoyed talking with them throughout the week. Stacy and Reese and their daughter Josie (I hope I got the names right) were from Anchorage and were extremely generous and kind – from offering to pick up anything I needed in town, to giving me a piece of fresh salmon, to sharing with me a fabulous dinner of grilled salmon and vegetables with a curry sauce. Not that I would have gone hungry, mind you. Tim made sure of that. While I was in Portland, he made chili and a chicken stir fry for me. He takes such good care of me, and I miss him when he’s not around. This past week in my little piece of paradise was just what I had envisioned. I had time to sleep late, write a few blog posts, catch up on reading and relish several days of sunny weather. Kitty enjoyed spending lots of time outside, when she wasn’t looking after me. The last day or so of rain didn’t even dampen my spirits, but provided a good excuse for afternoon naps. I loved being able to stay in one spot for a week, and I especially enjoyed watching how the view from my window changed with the light and the weather. I’ve included a few photographs to show the many moods that I witnessed. It was a good week.